*Gabriel M. Wilner/UGA Foundation Professor in International Law, University of Georgia School of Law. Thank you to Gregory Shaffer, M.J. Durkee, Tim Meyer, Reuven Avi-Yonah, Nicolas Lamp, Mona Pinchis-Paulsen, Joshua Barkan, Julian Arato, Ben Heath, Thomas Streinz, and participants in the UC Irvine Reconceiving Trade Agreements for Social Inclusion Workshop, the ESIL International Economic Law Workshop, and the Brooklyn Law International Business Law Roundtable. Thanks also to Lauren Brown, Ashley Henson, Dana Lohrberg, and Steven Zavodnick. 1 See, e.g., Betsy Cooper, Daniel Cox, E.J. Dionne Jr., Rachel Lienesch, Robert P. Jones & William A. Galston, How Immigration and Concerns About Cultural Change Are Shaping the 2016 Election, PRRI/Brookings Inst. 2016 Immigration Survey (June 23, 2016), at https://www.prri.org/research/prri-brookings-poll-immigration-economy-trade-terrorism-presidential-race (“A majority (52%) of the public says that free trade agreements with other countries are mostly harmful because they send U.S. jobs overseas and drive down wages.”). 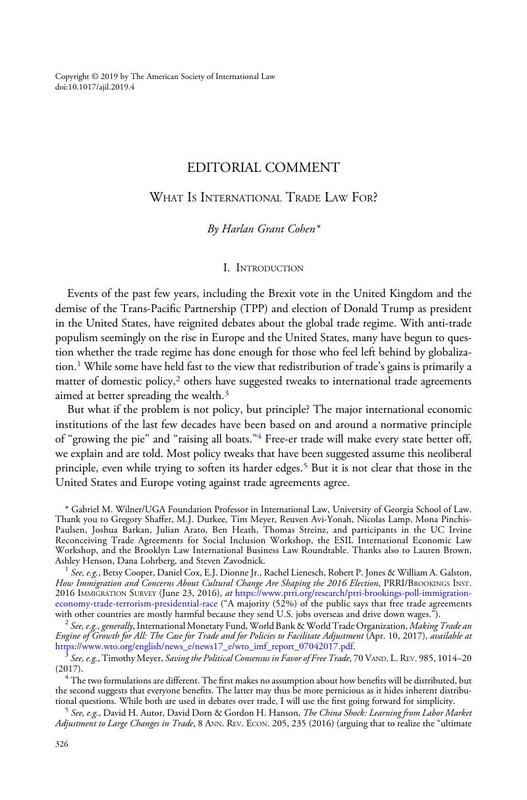 2 See, e.g., generally, International Monetary Fund, World Bank & World Trade Organization, Making Trade an Engine of Growth for All: The Case for Trade and for Policies to Facilitate Adjustment (Apr. 10, 2017), available at https://www.wto.org/english/news_e/news17_e/wto_imf_report_07042017.pdf. 3 See, e.g., Meyer, Timothy, Saving the Political Consensus in Favor of Free Trade, 70 Vand. L. Rev. 985, 1014–20 (2017). 4 The two formulations are different. The first makes no assumption about how benefits will be distributed, but the second suggests that everyone benefits. The latter may thus be more pernicious as it hides inherent distributional questions. While both are used in debates over trade, I will use the first going forward for simplicity. 5 See, e.g., Autor, David H., Dorn, David & Hanson, Gordon H., The China Shock: Learning from Labor Market Adjustment to Large Changes in Trade, 8 Ann. Rev. Econ. 205, 235 (2016) (arguing that to realize the “ultimate and sizeable net gain” from trade, new ideas must be set forth to hasten “the speed of regional labor-market adjustment”). An important exception is Shaffer, Gregory, Retooling Trade Agreements for Social Inclusion, 2019 Ill. L. Rev. 1 (2019). 6 See Bernard Hoekman & Douglas Nelson, 21st Century Trade Agreements and the Owl of Minerva, at 12 (European University Institute Robert Schuman Centre for Advanced Studies Global Governance Programme Working Paper RSCAS 2018/04). 7 See Dani Rodrik, The Globalization Paradox: Democracy and the Future of the World Economy 253 (2011). 8 See Read Donald Trump's Speech on Trade, Time (June 28, 2016), at http://time.com/4386335/donald-trump-trade-speech-transcript; Russell Berman, Hillary Clinton Abandons Obama on Trade, Atlantic (Oct. 7, 2015), at https://www.theatlantic.com/politics/archive/2015/10/hillary-clinton-abandons-obama-on-trade/409546. 9 See Jackie Calmes, T.P.P. Faces Rough Road in Congress, N.Y. Times (Sept. 1, 2016), at https://www.nytimes.com/2016/09/02/business/international/pacific-trade-pact-faces-rough-road-in-congress.html. 10 See Pew Research Ctr., Clinton, Trump Supporters Have Starkly Different Views of a Changing Nation, at 27–30 (Aug. 2016). 11 See AFL-CIO, Joint Statement by the AFL-CIO and ETUC on Fair Trade Practices (June 15, 2018), at https://aflcio.org/2018/6/15/afl-cio-and-etuc-support-fair-trade-practices. 12 Appellate Body Report, United States—Import Prohibition of Certain Shrimp and Shrimp Products (Recourse to Article 21.5 of the DSU by Malaysia), paras. 135–38, 153–54, WT/DS58/AB/RW (Oct. 22, 2001). 13 See Meyer, supra note 3, at 1002–08; Kathleen Claussen, Reimagining Trade+ Enforcement Institutions (unpublished paper on file with author). 14 See infra notes 50–62 and accompanying text. 15 See Timothy Meyer, Misaligned Lawmaking, 73 V and. L. Rev. (forthcoming 2020). 16 See Cover, Robert M., The Supreme Court, 1982 Term—Foreword: Nomos and Narrative, 97 Harv. L. Rev. 4 (1983). 17 See Hoekman and Nelson, supra note 6, at 14–18. 18 See Ronald Dworkin, Law's Empire 254–58 (1986). 19 See Thomas M Franck, Legitimacy in the International System, 82 AJIL 705, 712 (1988). 20 See Dworkin, supra note 18, at 176–224. 21 See Lon L. Fuller, The Morality of Law (1964). 22 See Hoekman and Nelson, supra note 6. 23 See Robert Z. Lawrence & Robert E. Litan, Why Protectionism Doesn't Pay, Harv. Bus. Rev. 60, 61, passim (May 1987). 24 See Barry Eichengreen & Douglas Irwin, The Protectionist Temptation: Lessons from the Great Depression for Today, Vox (Mar. 17, 2009), at https://voxeu.org/article/protectionist-temptation-lessons-great-depression-today. 25 See International Trade Law 11–19 (Joost Pauwelyn, Andrew Guzman & Jennifer Hillman eds., 3d ed. 2016). 26 See Making Trade an Engine of Growth for All, supra note 2, at 24. 27 See Paul Krugman & Maurice Obstfeld, International Economics: Theory & Policy 214–17 (7th ed. 2005). 28 See Pablo D. Fajgelbaum & Amit K. Khandelwal, Measuring the Unequal Gains from Trade, 131 Q. J. Econ. 1113 (2016). 29 Rodrik, supra note 7, at 163–74. 31 See No Change: Chinese Politics and the WTO, Economist (Dec. 10, 2011) (quoting President Clinton's prediction China's WTO admission “was likely to have ‘a profound impact on human rights and political liberty’”). 32 See Mireya Solis, The Case for Trade and the Trans-Pacific Partnership, Brookings Inst. (Oct. 4, 2016), at https://www.brookings.edu/research/the-trans-pacific-partnership-the-politics-of-openness-and-leadership-in-the-asia-pacific. 34 See generally Guzman, Andrew T., Global Governance and the WTO, 45 Harv. Int'l L.J. 303 (2004). See also Shaffer, supra note 5, at 5–8. 35 See, e.g., Sykes, Alan O., The Safeguards Mess: A Critique of WTO Jurisprudence, 2 World Trade Rev. 261 (2003). 36 See Making Trade an Engine of Growth for All, supra note 2, at 27–36. 37 See Meyer, supra note 3; Making Trade an Engine of Growth for All, supra note 2, at 4. 38 See Shaffer, supra note 5, at 8, 11. 39 S ee Dani Rodrik, How to Save Globalization from its Cheerleaders, at *21 (John F. Kennedy School of Government Faculty Working Paper Series), available at https://drodrik.scholar.harvard.edu/files/dani-rodrik/files/how-to-save-globalization-from-cheerleaders.pdf (“The appropriate locus for their discussion and resolution is most likely the national polity, given the wide variety of standard and norms that prevail across the globe.”); Krugman & Obstfeld, supra note 27, at 221 (“It is always preferable to deal with market failures as directly as possible.”). 40 Cf. Rittich, Kerry, Enchantments of Reason/Coercions of Law, 57 U. Miami L. Rev. 727, 734 (2003) (“[T]he result is the separation of social and distributional concerns from the rules governing the economy.”). 41 See Park, Stephen Kim, Bridging the Global Governance Gap: Reforming the Law of Trade Adjustment, 43 Geo. J. Int'l L. 797, 799 (2012). 42 See Meyer, Misaligned Lawmaking, supra note 15. 44 Hoekman and Nelson, supra note 6, at 20 (citing Swank, Duane & Betz, Hans-Georg, Globalization, the Welfare State and Right-Wing Populism in Western Europe, 1 Socio-Economic Rev. 215 (2003)). 45 See Tran Thu, U.S. To Lift Most Tariffs on Vietnam Footwear, Saigon Times (Nov. 11, 2015), at http://english.thesaigontimes.vn/44022/US-to-lift-most-tariffs-on-Vietnam-footwear.html. 46 Dani Rodrik, Populism and the Economics of Globalization, J. Int'l Bus. Pol'y 4 (June 2018). 47 See Rodrik, Dani, What Do Trade Agreements Really Do?, 32 J. Econ. Persp. 73, 82–88 (2018). 48 See id. at 84. 50 See, e.g., Oisin Suttle, Distributive Justice and World Trade Law 37–48 (2018) (describing theories). 51 See generally Samuel Moyn, Not Enough: Human Rights in an Unequal World (2018). 52 See Andrew Lang, World Trade Law After Neoliberalism: Reimagining the Global Economic Order 44–52 (2011); Desierto, Diane A., Postcolonial International Law Discourses on Regional Developments in South and Southeast Asia, 36 Int'l J. Legal Info. 387, 402–05 (2008). 53 See Nicolas Lamp, How Should We Think About the Winners and Losers from Globalization? Three Narratives and Their Implications for the Redesign of International Economic Agreements (Queen's University Legal Research Paper No. 2018-102, Nov. 26, 2018). 54 See Binyamin Appelbaum, On Trade, Donald Trump Breaks With 200 Years of Economic Orthodoxy, N.Y. Times (Mar. 10, 2016) (“Mr. Trump's mercantilism is among his oldest and steadiest public positions.”). 55 Cf. Lamp, supra note 53, 4–13. 56 See id. at 4–10. 57 See McCrudden, Christopher & Davies, Anne, A Perspective on Trade and Labor Rights, 3 J. Int'l Econ. L. 43, 49 (2000). 58 Cf. Eliason, Antonia, Development and Regional Trade Agreements: Entrenching Structural Inequities, 46 Ga. J. Int'l & Comp. L. 635, 646 (2018) (“Using this framing, the division becomes … one between the transnational capitalist class and those that do not benefit from the financial gains of late capitalism.”). 59 See Rangel, Charles B., Moving Forward: A New, Bipartisan Trade Policy that Reflects American Values, 45 Harv. J. Legis. 377, 394 (2008). 60 See, e.g., N. Gregory Mankiw, Why Economists Are Worried About International Trade, N.Y. Times (Feb. 16, 2018) (“[E]xpanding trade hurts some people in the short run… . That fact may call for a robust safety net and effective retraining. But it does not undermine the conclusion that free trade raises average living standards.”). 61 See Making Trade an Engine of Growth for All, supra note 2, at 4 (“[G20 leaders] called for action to better communicate the benefits of open trade to a public that may have become more skeptical, especially in advanced economies.”). 62 See Ruggie, John Gerard, International Regimes, Transactions, and Change: Embedded Liberalism in the Postwar Economic Order, 36 Int'l Org. 379 (1982). 63 Karl Polanyi, The Great Transformation (1944). 65 See Eichengreen & Irwin, supra note 24. 67 See Ruggie, supra note 62, at 393. 68 See id. at 396. 69 See Robert Howse, From Politics to Technocracy—And Back Again: The Fate of the Multilateral Trading Regime, 96 AJIL 94 (2002). 70 See id. at 101. 71 See id. at 104. 72 See Franklin D. Roosevelt, State of the Union Address (Jan. 6, 1941), available at https://fdrlibrary.org/four-freedoms. 73 Universal Declaration of Human Rights, Dec. 10, 1948, available at http://www.un.org/en/universal-declaration-human-rights. 74 International Covenant on Civil and Political Rights, Dec. 16, 1966, 999 UNTS 171, available at https://www.ohchr.org/en/professionalinterest/pages/ccpr.aspx; International Covenant on Economic, Social and Cultural Rights, Dec. 16, 1966, 993 UNTS 3, available at https://www.ohchr.org/en/professionalinterest/pages/cescr.aspx [hereinafter ICESCR]. 75 See supra notes 67–69 and accompanying text. 76 ICESCR, supra note 74, Art. 2.1. 77 See Martha Nussbaum & Amartya Sen, The Quality of Life (1993). 78 See Ochoa, Christiana, Advancing the Language of Human Rights in a Global Economic Order: An Analysis of a Discourse, 23 B.C. Third World L.J. 57, 58–59 (2003). 79 See, e.g., Rachel Brewster, Trump Is Breaking the WTO. Will China Want to Save It?, Wash. Post (May 2, 2018), at https://www.washingtonpost.com/news/monkey-cage/wp/2018/05/02/trump-is-breaking-the-wto-will-china-want-to-save-it/?utm_term=.04c861af032b. 80 Branko Milanović, The Greatest Reshuffle of Individual Incomes Since the Industrial Revolution, Vox (July 1, 2016), at http://voxeu.org/article/greatest-reshuffle-individual-incomes-industrial-revolution (describing the now famous “elephant graph”). 81 See generally Suttle, supra note 50. 82 The struggle to reconcile domestic and international obligations in theories of justice is well-known, and exemplified in John Rawls, The Law of Peoples (1999). 83 Cf. Shaffer, supra note 5, at 5 (“[T]rade officials … can lose sight of these goals by narrowing the operational goal of trade agreements to that of trade liberalization.”). 85 Meyer, Timothy, How Local Discrimination Can Promote Global Public Goods, 95 B.U. L. Rev. 1937 (2015). 86 See Thomas Piketty, Capital in the Twenty-First Century (Arthur Goldhammer trans., 2014). 87 See supra note 77 and accompanying text. 88 See Avi-Yonah, Reuven S., Globalization, Tax Competition, and the Fiscal Crisis of the Welfare State, 113 Harv. L. Rev. 1573, 1575–76 (2000). 89 See John Gapper, Apple, Keep Your Cool Over Global Tax, Fin. Times (Aug. 31, 2016), at https://www.ft.com/content/de2cbd7c-6f5e-11e6-a0c9-1365ce54b926. 90 See Tax Cuts and Jobs Act, Pub. Law No. 115-97, § 13001 (Dec. 22, 2017) (lowering the corporate tax rate to 21%). 91 See Avi-Yonah, supra note 88, at 1575. 92 See id. at 1624; Christians, Allison, How Nations Share, 87 Indiana L.J. 1407, 1408 (2012). 93 AFL-CIO, Making NAFTA Work for Working People, at 22–25 (2017), at https://aflcio.org/statements/written-comments-how-make-nafta-work-working-people. 94 OECD, Action Plan on Base Erosion and Profit Shifting (2013). 95 … partly, by shifting income from corporations to individuals. 96 See Shaffer, supra note 5, at 20–21. See also Brad Setser, The Global Con Hidden in Trump's Tax Reform Law, Revealed, N.Y. Times (Feb. 6, 2019), at https://www.nytimes.com/2019/02/06/opinion/business-economics/trump-tax-reform-state-of-the-union-2019.html. 97 Cf. Carol C. Gould, Approaching Global Justice Through Human Rights, in Global Justice and International Economic Law: Opportunities and Prospects 41 (Chios Carmody, Frank J. Garcia & John Linarelli eds., 2012). 98 See Garcia, Frank J. & Meyer, Timothy, Restoring Trade's Social Contract, 116 Mich. L. Rev. Online. 78, 93–100 (2018). 99 Thomas Streinz, Re-embedding Liberalism: Introducing “Passporting Fees” for Free Trade (unpublished manuscript, on file with author). 100 See Housman, Robert F. & Orbuch, Paul M., Integrating Labor and Environmental Concerns into the North American Free Trade Agreement: A Look Back and a Look Ahead, 8 Am. U. J. Int'l L. & Pol'y 719 (1993). 101 North American Agreement on Environmental Cooperation, opened for signature Sept. 8, 1993, 32 ILM 1480; North American Agreement on Labor Cooperation, Sept. 14, 1993, 32 ILM 1499. 102 See Meyer, Saving the Political Consensus, supra note 3, at 1002–08 (discussing examples). 103 See Trans-Pacific Partnership, Art. 19.3 (“Each Party shall adopt and maintain in its statutes and regulations, and practices thereunder, the following rights as stated in the ILO Declaration… .”). 104 See Brunei Darussalam – United States Labour Consistency Plan, Feb. 4, 2016, available at https://ustr.gov/sites/default/files/TPP-Final-Text-Labour-US-BN-Labour-Consistency-Plan.pdf; Malaysia – United States Labour Consistency Plan, Feb. 4, 2016, available at https://ustr.gov/sites/default/files/TPP-Final-Text-Labour-US-MY-Labour-Consistency-Plan.pdf; United States – Viet Nam Plan for the Enhancement of Trade and Labour Relations, Feb. 4, 2016, available at https://ustr.gov/sites/default/files/TPP-Final-Text-Labour-US-VN-Plan-for-Enhancement-of-Trade-and-Labour-Relations.pdf. 105 United States – Viet Nam Plan for the Enhancement of Trade and Labour Relations, supra note 104. 106 See Trans-Pacific Partnership, Art. 19.15.12. 107 See Claussen, supra note 13 (detailing how these agreements currently work and the role granted to labor and other private parties). 108 Understanding on Rules and Procedures Governing the Settlement of Disputes, Art. 23, Apr. 15, 1994, Marrakesh Agreement Establishing the World Trade Organization, Annex 2, 1869 UNTS 401. 109 Agreement on Implementation of Article VI of the General Agreement on Tariffs and Trade 1994, Apr. 15, 1994, Marrakesh Agreement Establishing the World Trade Organization, Annex 1A, 1868 UNTS 201. 110 Shaffer, supra note 5, at 34–43. 112 Trans-Pacific Partnership, Art. 25.5.2(b). 113 See id. Art. 25.4.1. 114 See id. Art. 25.8. 115 See Hoekman & Nelson, supra note 6, at 9–10. 116 See Rodrik, supra note 7, at 253. 117 To be fair, the poorest developing countries do retain considerable flexibility in this regard under the Agreement on Subsidies and Countervailing Measures. 118 See Rodrik, supra note 7, at 135–83. 119 See Agreement on Subsidies and Countervailing Measures, Art 3.1(a), available at https://www.wto.org/english/docs_e/legal_e/24-scm_01_e.htm. 120 Shaffer, supra note 5, at 34–43. 121 See Nichola Groom, Billions in U.S. Solar Projects Shelved After Trump Panel Tariff, Reuters (June 7, 2018). 122 Cf. Meyer, supra note 85. 123 See, e.g., Appellate Body Report, European Communities—Measures Prohibiting the Importation and Marketing of Seal Products, WT/DS400/AB/R, WT/DS401/AB/R (adopted June 18, 2014) (seeing exceptions as undercutting argument for seal fur ban); Panel Report, United States—Measures Affecting the Production and Sale of Clove Cigarettes, WT/DS406/R (Sept. 2, 2011) (rejecting market realities as justification for clove cigarette exclusion). 124 See Kellie Ell, Former Office Depot CEO: Using Tariffs to Bolster Trade Leverage Is Working for Trump, CNBC (May 31, 2018), at https://www.cnbc.com/2018/05/31/trump-uses-tariffs-to-bolster-trade-leverage--and-its-working-ceo.html. 125 See Krzysztof J. Pelc, The U.S. Broke a Huge Global Trade Taboo. Here's Why Trump's Move Might Be Legal, Wash. Post (June 7, 2018), at https://www.washingtonpost.com/news/monkey-cage/wp/2018/06/07/the-u-s-broke-a-huge-global-trade-taboo-heres-why-trumps-move-might-be-legal/?noredirect=on&utm_term=.cd95c5062647. 126 See, e.g., Ryohei Yasoshima, US-South Korea Steel Deal Tests WTO Rules, Nikkei Asian Rev. (Mar. 27, 2018), at https://asia.nikkei.com/Economy/US-South-Korea-steel-deal-tests-WTO-rules. 127 See generally Weiler, Joseph H. H., Editorial: Black Lies, White Lies and Some Uncomfortable Truths in and of the International Trading System, 29 Eur. J. Int'l L. 339 (2018). 128 See, e.g., Brewster, supra note 79.